All buildings must give their occupants some level of security from environmental forces. While general weather patterns like wind and rain are commonplace, seismic activity is far less frequent but poses greater risks to the structural integrity of buildings. Guidelines that help to reduce the risk of individuals from earthquakes and seismic activity address the design of the buildings and structures that they inhabit. While it is not known exactly how the tectonic plates of the Earth were formed, it is believed that these boundaries were carved out about 3 billion years ago, once the colder parts of the crust were pulled downwards into the upper mantle. The initial movement of these plates is very similar to the geologic process of subduction, in which one plate passes under another. 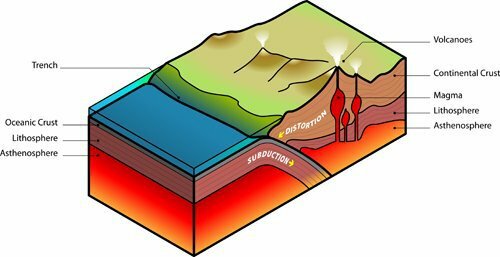 Subduction of convergent plates (two plates that are moving towards each other) is responsible for the formation of many of the Earth’s mountains. The plate tectonics alternative of convergent plates is divergent plates (which are moving away from each other). The heat produced from radioactive decay in the core of the Earth causes convection currents in the mantle, which is responsible for continental drift. When this movement creates a convergent boundary, the breaking rock underground can induce seismic activity. Places on fault linesare incredibly prone to this, such as India, Pakistan, Indonesia, and Turkey, just to name a few. However, while major earthquakes are caused by plate tectonics, the main requirement for them is for rock to break underground along a fault. This makes it possible for seismic activity to occur at places distant from fault lines. 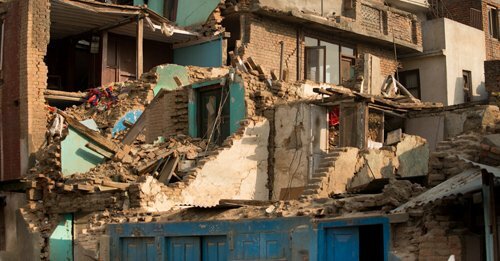 On average, about 10,000 people die every year from Earthquakes, and in extreme instances, the fatalities have amounted to tens of thousands. Most efforts to assure the safety of the victims of the natural disasters are often placed in securing the foundation of buildings, but there are still significant threats posed from the operational and functional components (OFCs) of buildings. OFCs (also known as non-structural components) include cladding, roofing, HVAC systems, electrical systems, and interior walls, all of which can be easily damaged from seismic activity and pose harm to the building’s occupants as they are in close contact with them. CSA S832-2014 – Seismic risk reduction of operational and functional components (OFCs) of buildings provides information and methodologies for the identification of seismic hazards associated with OFCs and for carrying out appropriate mitigation techniques. With a more concentrated scope, ANSI/ASHRAE STANDARD 171-2017 – Method of Testing for Rating Seismic and Wind Restraints specifies the testing procedures for the devices used to secure HVAC equipment from seismic activity by determining the maximum force it can withstand. Even though the main interest of these guidelines is safety, they also prevent property damage. The financial repercussion of earthquakes is the focus of a newly revised standard, ASTM E2026-16A – Standard Guide for Seismic Risk Assessment of Buildings, which provides guidance on the seismic risk assessment for buildings. It is intended for lenders, insurers, and equity owners to be able to accurately to consider the financial risks posed to their investments. In the event of harmful seismic activity, there is the possibility that people will not be located inside buildings. Therefore, safeguarding buildings from earthquakes and seismic activity does not guarantee the safety of every individual near an epicenter. ISO 3010:2017 – Basis for design of structures – Seismic actions on structures gives engineered structures the ability to resist seismic actions through appropriate design requirements, which are fully compatible with ISO 2394:2015 – General principles on reliability for structures. It is also important to remember that the damages brought onto buildings and structures from seismic activity can introduce unique problems if those buildings and structures serve a particular purpose that can be severely compromised by the impact of an earthquake. For example, seismic activity can threaten the functions of power plants and the safety of their workers. We’ve discussed this in our past post: Nuclear Power Plant Response to an Earthquake.